Could your construction project benefit from grab hire in Derby, Nottingham or Leicester? Read this guide to learn all you need to know about grab hire and see how Colson Transport can help, the leading industry experts for waste removal in the East Midlands. Similar to skip hire, our grab lorry hire provides a cost effective way of removing substantial volumes of waste from a construction site. What differentiates it from a skip, is that each truck arrives with an operator who will load your waste and remove it, doing all the hard work for you. Think of it like a skip on wheels, with a large hydraulic arm that will pick up your waste from wherever you leave it. With Colson Transport’s impressive fleet of 8 wheel grab trucks capable of carrying 16 tonnes, our grab hire service can collect a lot more waste in one go than a skip can! Why would you choose grab hire over a skip? Eliminates the need for the laborious task of having to load a skip yourself. It is possible to remove waste in much larger quantities – perfect for big construction sites. The hydraulic arm of a grab lorry is capable of reaching over walls and fences, making it ideal for collecting waste those hard to reach locations. The waste is cleared in a very short space of time. Our operators are fully trained to act in a swift, professional manner in order to keep things moving with your project. What about the delivery of aggregate materials? Our grab lorries are perfectly suited for delivering aggregate materials to your construction site, such as topsoil, gravel, sand and many others. We can provide these in whichever quantity suits you, for domestic or commercial purposes. If you’d like to know more about the aggregate construction materials we can deliver in Nottingham, Derby and Leicester, we would be happy to discuss this with you. Give Colson Transport a call on 01773 765 720.
Who uses our grab hire service? Home renovations such as redoing a driveway, building small extensions, or relaying the patio, can result in large amounts of waste. Our grab lorry service can offer a helping hand with the heavy lifting to remove your waste. Gardening projects such as landscaping, installing ponds, laying artificial grass and many more, require aggregate materials. Our grab trucks can deliver gardening materials such as topsoil and gravel, and simultaneously remove unwanted waste from your site. 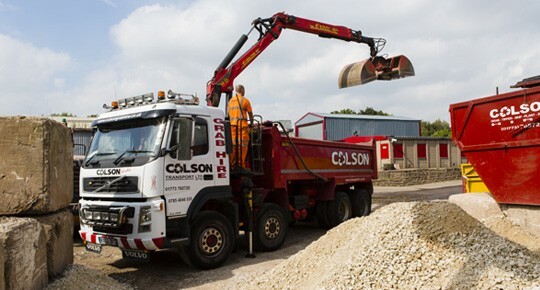 Colson Transport Ltd are a family run business with generations of experience in waste removal. Whether you need skip hire or grab hire in Derby, Nottingham or Leicester, our skilled operators and highly equipped fleet can help. Browse our range of waste removal services or give us a call today on 01773 765 720.